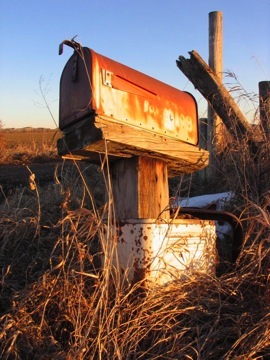 A written complaint can end up in a mailbox that looks like this if not address to the right person. Sometimes voicing your issues in person, to the appropriate party, is the most effective approach. When that fails, or isn't an option, the next step is to find the right person who can effectively handle and resolve your issue. Sometimes, it's best to "follow the chain of command" up from the front-line manager all the way to the CEO, but the best course of action is to be certain you address your letter to the person who can effectively resolve your issue! How do you determine who that person is? It can be tricky, but with a little investment of time, you can figure it out. If you're looking for a person within the federal government, start at USA.gov, where you can find Government Agencies and the names and titles of people who work there. If you're looking for a major corporation, check their company's website, and look for "About Us" or "Contact Information" or the "Investor Relations" page, which is sure to have the names and titles of higher-level executives with the company, as well as the corporate headquarters. For smaller companies that don't have a web presence, you can try calling them directly and asking for the name of the person who would be responsible for handling your issue. Chances are good that perhaps someone on the phone can help you get your issue resolved, and if not, then they can definitely give you the name and contact information of the person who can.